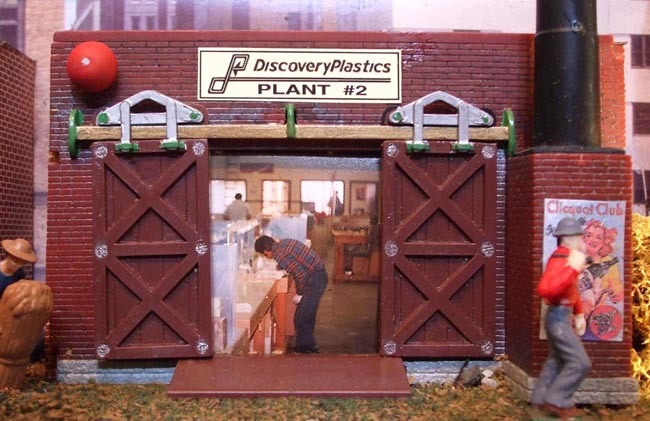 In the early years, when Discovery Plastics began to outgrow its storefront building, some manufacturing was moved to a second location across town. The second plant is celebrated here in an old brick building labeled Plant #2. The sliding doors are open; production workers can be seen inside, assembling Plexiglas displays. The Rohm & Haas Plastics Lab in Bristol, PA has drums of Plexiglas Molding Powder for injection molding as well as 4x8 sheets of paper masked Plexiglas sheet. I once worked in R&H's lab. 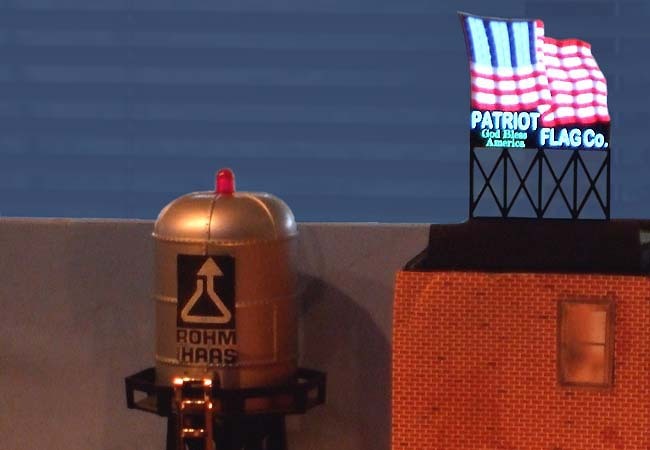 Patriot Flag Co. animated neon sign is located on the roof of the Rohm & Haas Pelletizer Cooling Tower, next to the water tower. White Castle is selling burgers for 5¢ each at the trolley stop on the middle level. There is a 1950 Chevrolet sedan parked out front. Behind it is a car carrier hauling a '56 Chevrolet Nomad station wagon, a '51 Volkswagen Beetle and a white '57 Thunderbird. The lower level of the carrier contains a red '57 Chevy Bel Air hardtop and a maroon 1950 Mercury coupe. Parked behind the car carrier is a turquoise '48 Ford woody wagon. 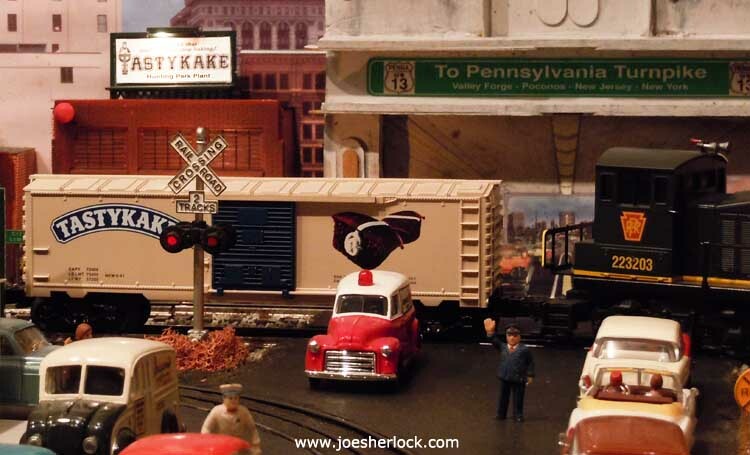 In 2012, additional lighting was added at the back of the train layout. 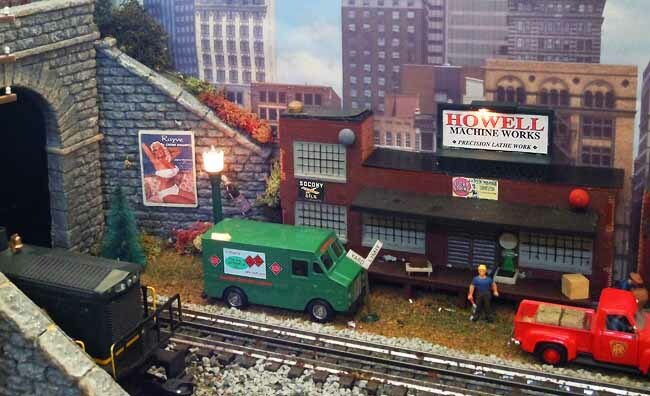 Howell Machine Works received an illuminated sign and a nearby streetlamp. 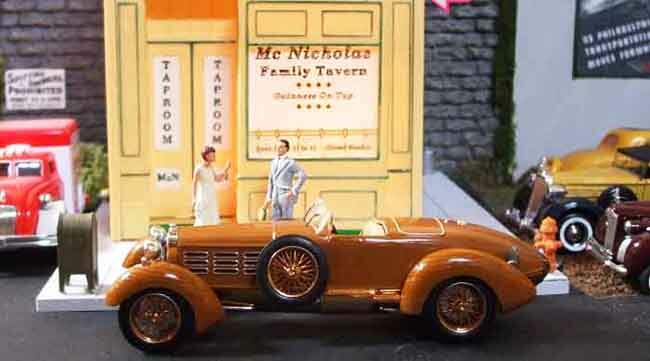 1924 Hispano-Suiza H6C 'Tulipwood' Torpedo parked in front of the McNicholas Family Tavern. More information on the Hispano-Suiza can be found here. 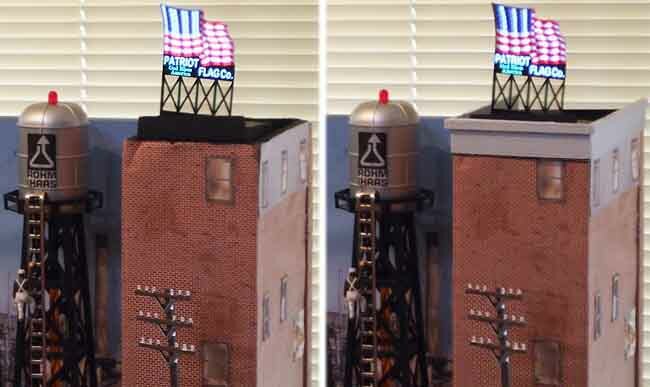 The tall brick R&H Pelletizing Cooling Tower building at the back right-hand corner of my model train layout was made to cover a triangular wood support brace which connects the back of the structure with the main body. The fake building was constructed from foam core art board and covered with printed brick paper. The windows and doors are printed paper as well. 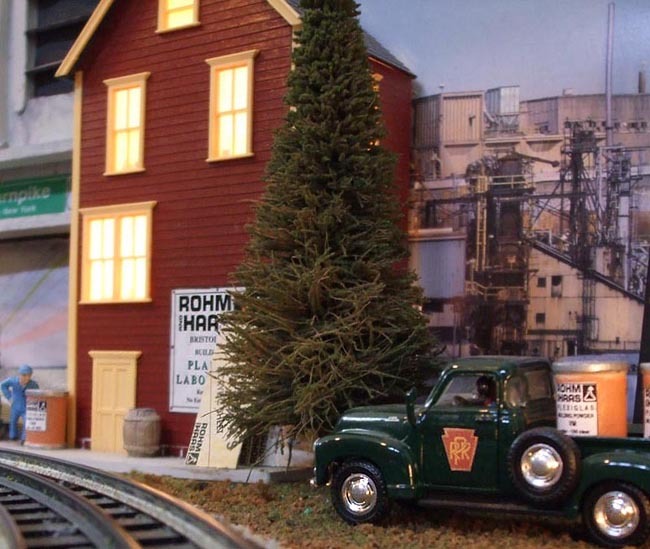 Many years of storing, moving and setting up the layout have taken their toll on the building, leaving it with dents and creases near the top. To cover up some of the damage, I fabricated a removable capstone surround from basswood which I painted a light gray concrete color to resemble real coping. The before and after photo shows what a difference it made.